On our trip to Japan in 2010, we visited Togakushi with my dad’s family and friends. 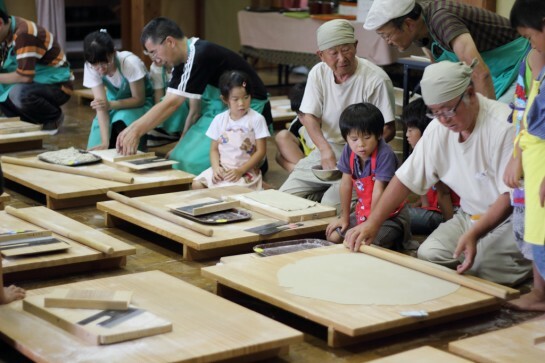 The region is known for their soba, so on the last day we went to a soba making class at a restaurant. 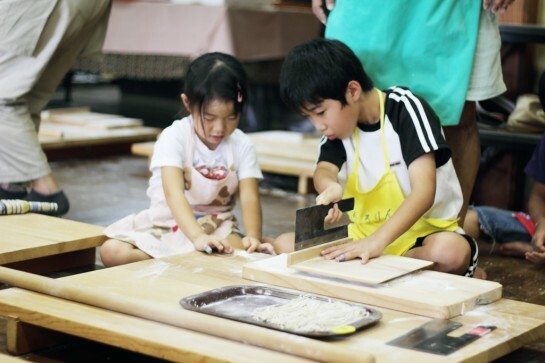 We were divided into 3 groups and proceeded with the process of vigorous kneading and rolling. I was surprised at this process since most techniques warn against overworking the dough. Once we got it to the right thickness, we were handed sharp, heavy cleavers to cut our dough into thin noodles. Those noodles headed straight to a vat of boiling water, cooled, and served to us. We slurped them right up and I discovered a new appreciation for it. 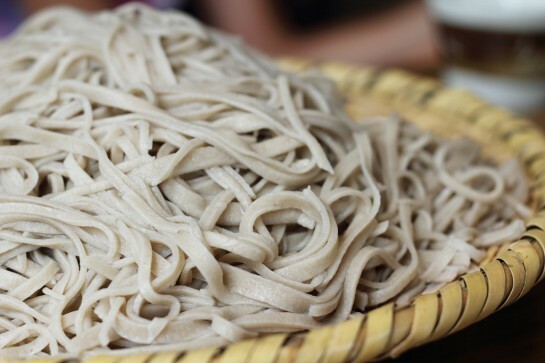 We went around trying each others soba and were surprised at the differences. Even with the same ingredients and process, our technique was varied enough that we could taste it. I’ve had a few soba noodle salads in my day and I haven’t come across one I really liked, mostly because I love the nuttiness of soba, and often it’s overwhelmed by strong vinegary flavors. 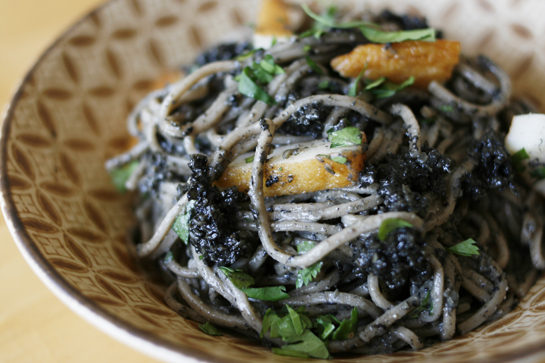 A recipe from 101 Cookbooks caught my eye because I love black sesame and the combination with soba looked dramatic. I had a feeling I would like this one, so I had to try it. It was far better than anything I’ve had in the past! I made my own additions and took out some ingredients, making it a little easier to assemble. Also, if you’re interested in soba as much as I am, check out Emma’s post on Shinshu soba at Shichimi. All those different soba noodles look so tasty! I’ve used a variety of soba brands. The more expensive ones did taste better and have a better texture, but I found that moderately priced brands did just fine. This is best served and eaten right away. I like my noodles a bit firm, so if the soba sits around too long it soaks up the sauce and becomes soft. Also, this can be made vegetarian with the omission of satsuma age. Toast sesame seeds in a 10″ skillet over high heat until fragrant, tossing constantly. Keep a close eye when doing this because once the sesame is burned, it’s no good. I test whether it’s done by touching the seeds and if they’re hot to the touch, I know they’re done. 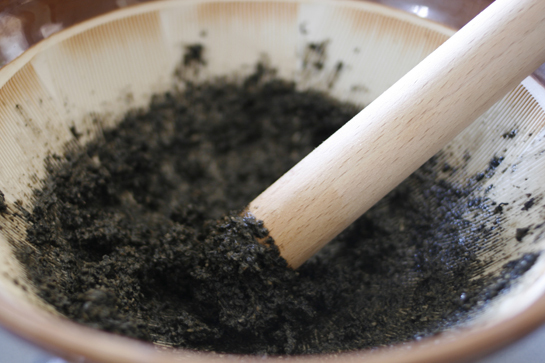 Place in a Japanese mortar and grind well. Alternatively, Heidi says you can use a food processor (I haven’t tried this). Add the sugar, shoyu, vinegar, and sesame oil and mix well. Boil a small pot of water for the satsuma age (if using). The age is already cooked, but you’ll want to blanch to get rid of the stale oil that coats it. Slice and set aside. Boil a large pot of water and cook the soba according to the package directions. It should take between 4 to 5 mins. Drain and run cold water over the soba to cool. Drain well or the final product will be soggy and diluted. Add the soba to the sesame mixture and toss until well incorporated. Add the green onions, cilantro, and and satsuma age and toss to combine. Serve immediately. This entry was posted in Contemporary Recipes, Favorites, Noodles, Salads and tagged boil, buckwheat, cilantro, fish cake, goma, green onion, satsuma age, scallion, sesame, sesame seeds, soba. Bookmark the permalink. Post a comment or leave a trackback: Trackback URL. Thanks for the shout-out, Azusa! Kurogoma’s been in heavy rotation in my kitchen lately, in both sweet and savory applications. I tend to agree with you about this soba salads, but this one looks too pretty to pass up. Emma, hope you give it a try. It’s also great for a quick lunch—you can pack the sesame mixture and soba separately and toss to combine before eating. Enjoy!